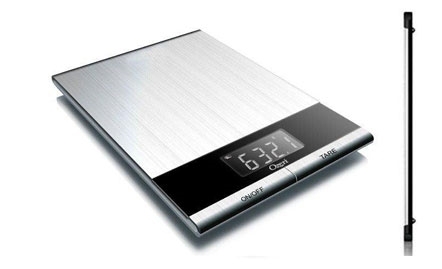 One of thinnest on the market, the Ozeri Ultra Thin Digital Kitchen Scale is only 11mm thick (less than half an inch) and made with commercial grade stainless steel. Equipped with 2 oversized buttons for easy operation, and a large LCD screen that displays weights in pounds (lbs), kilograms (kg), grams (g), and ounces (oz). Easy to clean stainless steel surface. Includes 2 Lithium Batteries and an Easy Access Battery Compartment (no screwdriver needed). One of thinnest on the market, the Ozeri Ultra Thin Digital Kitchen Scale is only 11mm thick (less than half an inch) and made with commercial grade stainless steel. Features 4 high precision sensors, the Ozeri Ultra Thin Digital Scale provides accurate measurements from 0.1 oz to 11 lbs (1 gram to 5250 grams). Equipped with 2 oversized buttons for easy operation, and a large LCD screen that displays weights in pounds (lbs), kilograms (kg), grams (g), and ounces (oz). Includes a Precision Tare feature that calculates the net weight of the ingredients (automatically subtracts the container weight to calculate the weight of the ingredients being weighed). Easy to clean stainless steel surface. Includes 2 Lithium Batteries and an Easy Access Battery Compartment (no screwdriver needed).